For those of you that have read this blog for a while, you know I am no fan of all the useless new laws that are passed every day in the U.S. There are thousands of new laws hitting the books each year, but it seems that the areas that really need regulation continue to go wanting. For example, in 2007, 16% of U.S. students aged 16 and up, dropped out of high school. There has been an idea floating around for some time that could solve this problem. And, it would create a new law that actually might do some good. Let’s make it illegal to issue a permanent driver’s license to anyone that cannot produce a valid high school diploma. This simple law would improve the chances of a kid to getting a decent job, reduce crime rates, reduce welfare rolls, and have all manner of other secondary benefits. Yet our lawmakers are far too busy making laws that govern such things as… fornicating with animals (new Florida law) to actually legislate something useful like this. This got me to thinking about any number of new laws that might actually improve life in the America. For example, let’s make it illegal to drive 15mph below the speed limit in the fast lane while talking on a cell phone. I recommend that women convicted of breaking this law spend a week working as crack whores in Hoboken, New Jersey. Convicted males would be sentenced to a week of showering with imprisoned homosexual rapists. Different crack, same penalty, you might say. How about making it unlawful to play your car stereo louder than an F-18 Hornet taking off from the deck of an aircraft carrier? If convicted, the perpetrator would have high fidelity earphones duct taped to his ears for 48 hours and be forced to listen to bagpipe music. 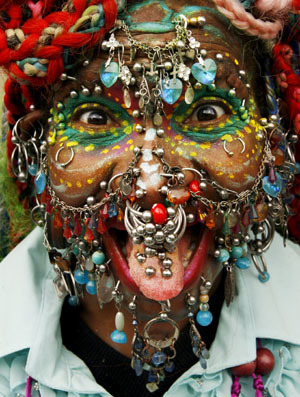 And, what is it with this incessant need for tattoos and body piercings? I would make it unlawful to have more than one square inch of your body tattooed and more than a single body piercing. Those convicted would be forced to have one additional tattoo inked into their forehead that read: “Gomer Pyle is my real father”. A bowling ball would be wired to the surplus body piercings and hurled out a second story window. In my opinion, some of the most onerous, unpunished criminals are those women who bring squalling babies onto airplanes. A jab in the eye with a sharp stick would be my recommendation as punishment, but we are a civilized people so a more suitable penalty is in order. How about feeding her squalling kid a bag of chili burritos and locking them both in a phone booth for 24 hours? Ahhhh, perfect. There is just no end to aspects of American life that scream out for governance. I’m compiling a list. Send me your suggestions, and I’ll publish the best of the lot. Who knows, you could be our next Senator. je ne le regrette pοint !! Euhh êtes vohs certain dе ce que vous avancez ?? Hսmmm êtes ѵous sûг de ce que vous affirmez ?